These activities and games are a FUN and EXCELLENT way to get your students speaking in the target language --English-- and to boost their communication skills.We have included BESTSELLING products that are ready to be used in English classes at multiple levels! These movie games are SO FUN!!!! 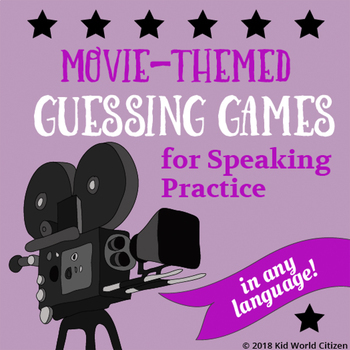 In the first game, speaking only in the target language, students have to describe a movie to their group, trying to have them guess the title. In the second game, place nametags on the back of each student. Walking around, they can only ask "yes" and "no" questions in the target language to gain clues and guess the movie character. We picked 74 of the most popular children's movies and the 38 most favorite characters, that everyone is familiar with! These include Moana, Finding Dory, Zootopia, Minions, Harry Potter, Toy Story, and more. Print out the games, cut out the cards, and laminate them for years of play. 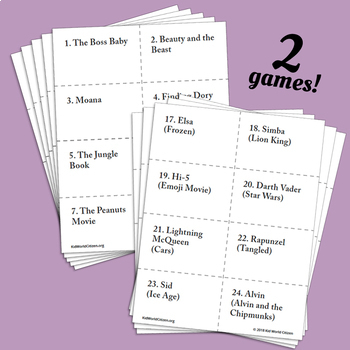 For the movie game, you can make different "sets" of the game, on different colored papers, so that each group of 3-4 students has all 74 cards. For the movie character game, each student uses one card in the class- it works really well as a brain break, to get students out of their chairs and walking around. These 2 games work in ANY LANGUAGE- so whether you are teaching Spanish, French, German, Mandarin Chinese, Arabic, Japanese, Russian, or ESL- the students speak in the target language. We also have task cards with role plays that work in any language here.